BORG WARNER CORP., YORK DIV. LA FAVORITE RUBBER MFG. CO. MID ATLANTIC ENGINE SUPPLY CO.
MTU OF NORTH AMERICA INC.
WM. W. NUGENT & CO., INC.
PRODUCTS RESEARCH & CHEMICAL CORP.
Touch" to ships it has built, converted, overhauled or repaired for over 65 years. Even longer when you consider a predecessor company assisted in the construction of the "Monitor" of Civil War fame. Divisions are being delivered ahead of or on time and within or under budget, saving millions of dollars for the U. S. Navy. 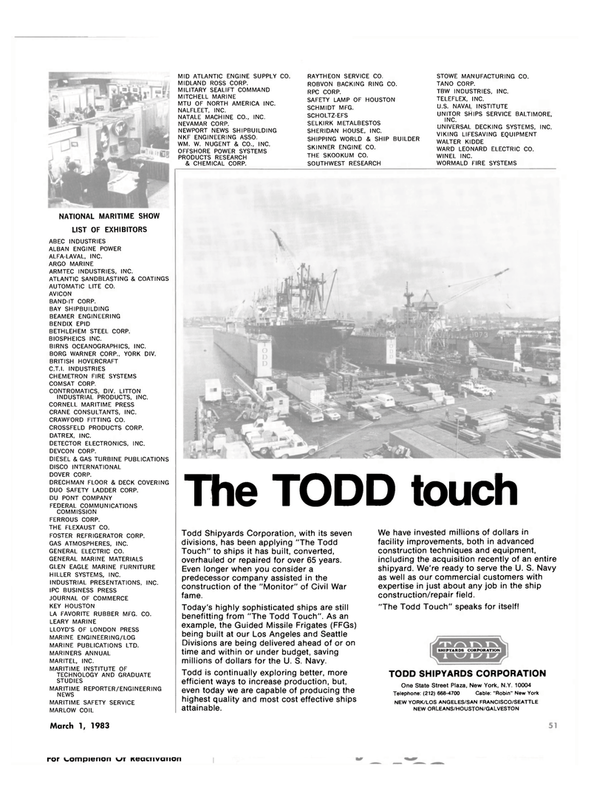 Todd is continually exploring better, more efficient ways to increase production, but, even today we are capable of producing the highest quality and most cost effective ships attainable. We have invested millions of dollars in facility improvements, both in advanced construction techniques and equipment, including the acquisition recently of an entire shipyard. We're ready to serve the U. S. Navy as well as our commercial customers with expertise in just about any job in the ship construction/repair field. "The Todd Touch" speaks for itself!